Invictus was released in the United States on December 11, 2009. The title refers to the Roman divine epithet Invictus and may be translated from the Latin as "undefeated" or "unconquered". "Invictus" is also the title of a poem, referred to in the film, by British poet William Ernest Henley (1849–1903). The film was met with positive critical reviews and earned Academy Award nominations for Freeman (Best Actor) and Damon (Best Supporting Actor). This plot section's chronology is ambiguous or out of order. Relevant discussion may be found on the talk page. Please do not remove this message until the described events are arranged in an unambiguous chronological sequence. On 11 February 1990, Nelson Mandela is released from Victor Verster Prison after having spent 27 years in jail. Four years later, Mandela is elected the first black President of South Africa. His presidency faces enormous challenges in the post-Apartheid era, including rampant poverty and crime, and Mandela is particularly concerned about racial divisions between black and white South Africans, which could lead to violence. The ill will which both groups hold towards each other is seen even in his own security detail where relations between the established white officers, who had guarded Mandela's predecessors, and the black ANC additions to the security detail, are frosty and marked by mutual distrust. While attending a game between the Springboks, the country's rugby union team, and England, Mandela recognises that the black people in the stadium are cheering for England, and not their own country, as the mostly-white Springboks represent prejudice and apartheid in their minds; he remarks that he did the same while imprisoned on Robben Island. Knowing that South Africa is set to host the 1995 Rugby World Cup in one year's time, Mandela persuades a meeting of the newly black-dominated South African Sports Committee to support the Springboks. 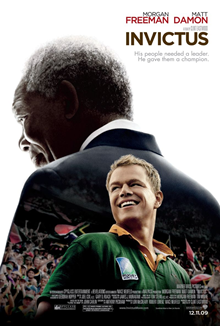 He then meets with the captain of the Springboks rugby team, François Pienaar (Matt Damon), and implies that a Springboks victory in the World Cup will unite and inspire the nation. Mandela also shares with François a British poem, "Invictus", that had inspired him during his time in prison. François and his teammates train. Many South Africans, both black and white, doubt that rugby will unite a nation torn apart by nearly 50 years of racial tensions, as for many black people, especially the radicals, the Springboks symbolise white supremacy. Both Mandela and Pienaar, however, stand firmly behind their theory that the game can successfully unite the South African country. Things begin to change as the players interact with the fans and begin a friendship with them. During the opening games, support for the Springboks begins to grow among the black population. By the second game, the whole country comes together to support the Springboks and Mandela's efforts. Mandela's security team also grows closer as the racially diverse officers come to respect their comrades' professionalism and dedication. As Mandela watches, the Springboks defeat one of their arch-rivals—Australia, the defending champions and known as the Wallabies—in their opening match. They then continue to defy all expectations and, as Mandela conducts trade negotiations in Taiwan, defeat France in heavy rain to advance to the final against their other arch-rival: New Zealand, known as the All Blacks. New Zealand and South Africa were universally regarded as the two greatest rugby nations, with the Springboks then the only side to have a winning record (20–19–2) against the All Blacks, since their first meeting in 1921. Before the game, the Springbok team visits Robben Island, where Mandela spent the first 18 of his 27 years in jail. There, Pienaar is inspired by Mandela's will and his idea of self-mastery in "Invictus". François mentions his amazement that Mandela "could spend thirty years in a tiny cell, and come out ready to forgive the people who put [him] there". Supported by a large home crowd of all races at Ellis Park Stadium in Johannesburg, Pienaar motivates his teammates for the final. Mandela's security detail receives a scare when, just before the match, a South African Airways Boeing 747-200 jetliner flies in low over the stadium. It is not an assassination attempt though, but a demonstration of patriotism, with the message "Good Luck, Bokke"—the Springboks' Afrikaans nickname—painted on the undersides of the plane's wings. Mandela also famously arrives onto the field before the match wearing a Springbok cap and a replica of Pienaar's #6 jersey. The Springboks complete their run by beating the All Blacks 15–12 in extra time, thanks to a drop goal from fly-half Joel Stransky. Mandela and Pienaar meet on the field together to celebrate the improbable and unexpected victory, and Mandela hands Pienaar the William Webb Ellis Cup, signaling that the Springboks are indeed rugby union's world champions. Mandela's car then drives away in the traffic-jammed streets leaving the stadium. As Mandela watches South Africans celebrating together in the street from his car, his voice is heard reciting "Invictus" again. Robin B. Smith as Johan de Villiers, sport commentator. The film is based on the book Playing the Enemy: Mandela and the Game that Made a Nation by John Carlin. The filmmakers met with Carlin for a week in his Barcelona home, discussing how to transform the book into a screenplay. Filming began in March 2009 in Cape Town. Primary filming in South Africa was completed in May 2009. Morgan Freeman was the first actor to be cast, as Mandela. Matt Damon was then cast as team captain François, despite being significantly smaller than him and much smaller than members of the current Springbok squad. He was given intensive coaching by Chester Williams, another star of the 1995 team, at the Gardens Rugby League Club. "In terms of stature and stars, this certainly is one of the biggest films ever to be made in South Africa," said Laurence Mitchell, the head of the Cape Film Commission. On March 18, 2009, Scott Eastwood was cast as flyhalf Joel Stransky (whose drop goal provided the Springboks' winning margin in the 1995 final). Over Christmas 2008, auditions had taken place in London to try to find a well-known British actor to play Pienaar's father, but in March it was decided to cast a lesser-known South African actor instead. Zak Fe'aunati, who had previously played professionally for Bath, was cast as Jonah Lomu, while Grant L. Roberts was cast as Ruben Kruger, who was the Springboks' other starting flanker in 1995. Chester Williams was also involved with the project to teach rugby to those of the cast playing players who had not played it before, while Freeman and Williams also became involved with the ESPN 30 For 30 film The 16th Man. Filming of the final also took place on location at Ellis Park Stadium, the actual venue for the 1995 final. 'Suzie' was not a character in the film and there was no reference to the health issues in the New Zealand squad. Invictus opened in 2,125 theaters in North America at #3 with US$8,611,147 and was the largest opening for a rugby-themed film. The film held well and ultimately earned $37,491,364 domestically and $84,742,607 internationally for a total of $122,233,971, above its $60 million budget. The film was met with generally positive reviews. Review aggregate Rotten Tomatoes reports that 76% of critics have given the film a positive review based on 237 reviews, with an average score of 6.6/10. The website's critical consensus is: "Delivered with typically stately precision from director Clint Eastwood, Invictus may not be rousing enough for some viewers, but Matt Damon and Morgan Freeman inhabit their real-life characters with admirable conviction." On Metacritic, the film has a weighted average score of 74 out of 100, based on 34 critics, indicating "generally favorable reviews". Anthony Peckham's sturdy, functional screenplay, based on John Carlin's book Playing the Enemy, can be a bit on the nose (and the message songs Eastwood adds are overkill). Yet the lapses fade in the face of such a soul-stirring story—one that would be hard to believe if it were fiction. The wonder of Invictus is that it actually went down this way. It is a very good film. It has moments evoking great emotion, as when the black and white members of the presidential security detail (hard-line ANC activists and Afrikaner cops) agree with excruciating difficulty to serve together. And when Damon's character—François Pienaar, as the team captain—is shown the cell where Mandela was held for those long years on Robben Island. My wife, Chaz, and I were taken to the island early one morning by Ahmed Kathrada, one of Mandela's fellow prisoners, and yes, the movie shows his very cell, with the thin blankets on the floor. You regard that cell and you think, here a great man waited in faith for his rendezvous with history. Don Beck, who had helped the rugby team succeed in 1995 as a close friend and adviser to coach Kitch Christie and team captain François Pienaar, found the film faithful to the true story. He remarked: "I thought it was steady and balanced." ^ tied with The Stoning of Soraya M.
^ a b "Invictus". American Film Institute. Retrieved February 26, 2017. ^ a b c "Invictus". Box Office Mojo. Retrieved February 13, 2015. ^ Thompson, Anne (June 10, 2009). "Produced By Conference: Are Boomers Abandoning Movies?". Variety. Archived from the original on June 14, 2009. Retrieved February 13, 2015. ^ Stephensen, Hunter (March 14, 2009). "First Look: Clint Eastwood's The Human Factor with Matt Damon". Slash Film. Archived from the original on 2012-06-04. Retrieved March 31, 2009. ^ Turner, Rob (March 22, 2009). "Life on the set with Clint Eastwood, by Welsh actor". Wales on Sunday. Retrieved May 6, 2009. ^ Leyes, Nick (March 15, 2009). "François Pienaar takes rugby union to Hollywood. Somanth as François Pienaar' brother". Daily Telegraph. Retrieved March 31, 2009. ^ "Photo showing Freeman and Damon at premiere". IMDB.com. Retrieved May 30, 2011. ^ "Photo". celebrity-gossip.net. Archived from the original on July 23, 2011. Retrieved December 19, 2010. ^ Rappe, Elisabeth (March 16, 2009). "Matt Damon Goes Blond For 'The Human Factor'". Cinematical.com. Retrieved March 31, 2009. ^ [dead link] "Matt Damon injured at rugby union training". The Times (South Africa). March 8, 2009. Retrieved March 31, 2009. ^ White, James (March 18, 2009). "Scott Eastwood joins the Mandela pic: Clint casts his son ..." TotalFilm.com. Retrieved March 31, 2009. ^ Jones, Alice-Azania (March 16, 2009). "Pandora: An accent beyond the best of British". The Independent. Retrieved March 31, 2009. ^ (March 25, 2009). Zak Feaunati to play Jonah Lomu in film, BBC News. Retrieved on May 6, 2009. ^ "Invictus (2009)". Rotten Tomatoes. Fandango Media. Retrieved March 20, 2018. ^ "Invictus Reviews". Metacritic. CBS Interactive. Retrieved March 20, 2018. ^ David Ansen (November 25, 2009). "'Invictus': A Whole New Ballgame". Newsweek. Retrieved December 7, 2009. ^ Roger Ebert (December 9, 2009). "Invictus". Chicago Sun-Times. Retrieved December 13, 2009. ^ Jake Tomlinson (December 10, 2009). "Review: Invictus". Shave. Retrieved December 23, 2009. ^ Todd McCarthy (November 27, 2009). "Invictus". Variety. Retrieved December 9, 2009. ^ "Academy Award nominations". Variety. February 2, 2010. Retrieved February 13, 2015. ^ Levine, Stuart (December 14, 2009). "BFCA announces its nominees". Variety. Retrieved February 13, 2015. ^ Keslassy, Elsa (February 25, 2011). "'Of Gods and Men' tops Cesar Awards". Variety. Retrieved February 13, 2015. ^ "Brees nominated for several ESPYS". ESPN. July 14, 2010. Retrieved February 13, 2015. ^ "67th Annual Golden Globes winners list". Variety. January 17, 2010. Retrieved February 13, 2015. ^ "2010 Movieguide Awards Winners". Movieguide Awards. 1 February 2010. Retrieved 29 June 2017. ^ Engelbrektson, Lisa (February 26, 2010). "'Precious' tops NAACP Awards". Variety. Retrieved February 13, 2015. ^ Engelbrektson, Lisa (January 6, 2010). "'Precious' tops NAACP nominations". Variety. Retrieved February 13, 2015. ^ Thielman, Sam (December 3, 2009). "NBR's best: 'Up in the Air'". Variety. Retrieved February 13, 2015. ^ McNary, Dave (January 5, 2010). "PGA unveils nominations". Variety. Retrieved February 13, 2015. ^ Barraclough, Leo (December 17, 2009). "SAG nominations list". Variety. Retrieved February 13, 2015. ^ Knegt, Peter (December 6, 2009). ""Up In The Air" Leads D.C. Critics Nods". Indiewire. Retrieved February 13, 2015. ^ "8th Annual VES Awards". visual effects society. Retrieved December 22, 2017. This page was last edited on 31 January 2019, at 03:37 (UTC).